Inger Lindell, Brev i Vadstena klosters arkiv 1368–1375. Samlingar utgivna av Svenska fornskriftsällskapet. Serie 1. Svenska skrifter 92. Uppsala 2010. 164 pp. ISBN 978-91-976118-5-5. This work describes the writing practices of the Vadstena Abbey as they appear in the oldest extant charters of the Abbey. The Abbey is known for the extensive production of manuscripts there, but little is known of the oldest manuscripts as only a limited number have survived. However, charters are a type of text that have been preserved and stored in large number in the Abbey archive. These include 47 charters from the period 1368-1375 in Old Swedish, where the content documents the property belonging to the Abbey. These charters have been systematically examined at various linguistic levels to provide an overview of the oldest use of language in methods of abbreviation vary across various charters but some patterns may be discerned. In line with prior research, it is assumed that these charters were written by the recipients, with some exceptions. It was in the interest of the prospective Abbey to document it’s property. One significant finding is that most of the actors concerned with the charters, those responsible for drawing up the charters, witnesses of seals and the recipients, were part of the network surrounding the founder of the Abbey, Birgitta Birgersdotter. They were from aristocratic families, members of the Privy Council, and many of them were related to Birgitta or had some other close association with her. A paleographic analysis has indicated that the charters have been the work of many writers, suggesting that there were many literate people among the community at the Abbey: the novices, the abbess and the founders. The system of formula for the charters has been based on a fairly consistent pattern with a concentration of fixed phrases, which suggests there was a wish to attain internal consistency. The system of formula employed in the writing of the charters also suggests close collaboration between writers. There are also several charters which have been drawn up in connection with religious festivals. The orthography of the charters has also been examined and this indicates a certain level of orthographic stability with regard to words that occur frequently. The words have been abbreviated more than twice. The most common principle of hyphenation has been to separate syllables of a single word and a hyphen inserted and to carry a consonant cluster to the next line, a principle which facilitates reading comprehension. The punctuation system is well developed and punctuation is predominantly rhythmic, but the units that are punctuated conform closely to syntactic units. Pertinence formulations, proper name phrases and place names are particularly marked. The charters contain few corrections which suggests that no institutional proof-reading was carried out. Most commonly, the writers themselves have corrected their own errors and those corrections that have been made are mainly concerned with content. But a number of corrections related to orthographic form indicate a general orthographic standard existed. The purpose of this research on the oldest charters in Old Swedish at the Abbey has been to outline the oldest writing practices as they appear in the charters. The roots of the written language that eventually developed in the Abbey may be discerned in the oldest writing practices. During the initial stage of a new writing environment various individual features of writing gradually merged into a more uniform form. 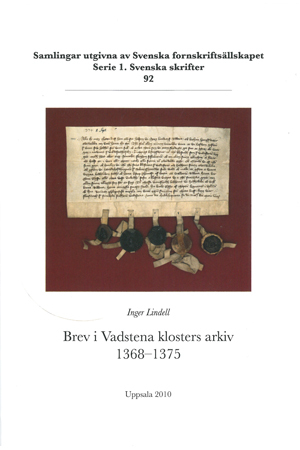 Keywords: Charters, literacy, Vadstena Abbey, Old Swedish, witnesses of seals, palaeography, system for formula, syllabification, punctuation, orthography, abbreviation, correction.